A Working Title (UK), Vincent Ward Film Productions Pty. Ltd. (Aust), Les Films Ariane (France), Sunrise Films (Canada). 1993. Director: Vincent Ward. Music: Gabriel Yared. CD (ST) Philips (France). 514900-2. 1993. (CD Verve (USA). 14900. 1993). 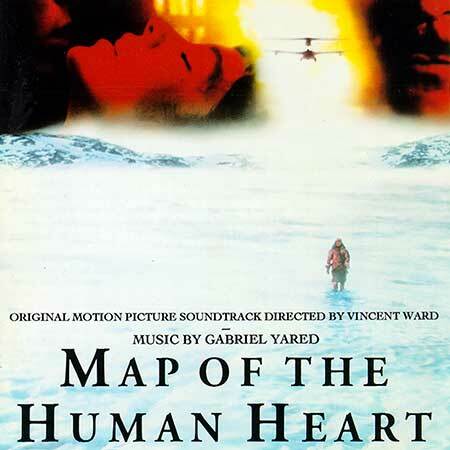 Map Of The Human Heart. (2:23). Instrumental. Ma Metisse. (3:40). (Louis Nowra, Philippe Ringenbach, Gabriel Yared). Performed by Marie Pelissier. Arranged and Produced by Michel Coeuriot in collaboration with Herve Lecoz and Gabriel Yared at Guillaume Tell Studio. Thrown Up In A Walrus Blanket. (1:26). Instrumental. The Artic Jig. (1:27). Instrumental. Like A Bird On The Way To Montreal. (3:48). Instrumental. Radio Voices Across The Ice. (1:36). (Louis Nowra, Gabriel Yared). Lovers On Balloon. (2:50). Instrumental. Barefoot In The Albert Hall. (3:32). Instrumental. Farmboy’s Death / Dresden Holocaust. (3:50). Instrumental. There’s A Map To My Heart. (0:45). Instrumental. The Wedding / End Music. (8:40). Instrumental. (1) Made in association with the Australian Film Finance Commission, Nippon Herald and Channel Four. Development assistance from the Australian Film Commission. Co-produced with the assistance of Tele Film Canada.